Two fresh fruit favorites come together in dramatic style. It's hard to believe it only takes 15 minutes to put this strawberry banana treat together! Stir boiling water into gelatin in large bowl at least 2 minutes until completely dissolved. Stir in cold water. Refrigerate about 1-1/2 hours or until thickened (spoon drawn through leaves definite impression). Stir in strawberries and banana. Pour into 5-cup mold sprayed with cooking spray. Refrigerate 4 hours or until firm. Unmold. Store leftover gelatin mold in refrigerator. Substitute 2 pkg. 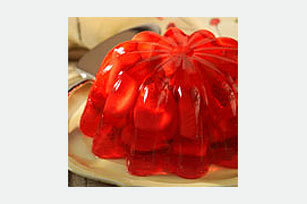 (4-serving size each) JELL-O Strawberry or Strawberry Banana Flavor Sugar Free Gelatin for 1 pkg. (8-serving size) gelatin.